Helps transport oxygen for more cellular energy. New highly concentrated to save you money! Contains 3,000 mg per ounce! DMG is a stamina supplement that plays a crucial role in the respiratory cycle of the cell, transporting oxygen and serving as a methyl donor. A horse's energy comes from a complex chemical reaction called the Kreb's cycle, sometimes called the "powerhouse of the body." DMG is used to help transport the oxygen that breaks down fuel for this "powerhouse". All the energy available to the horse's body comes from a complex chemical reaction within the mitochondria, small bodies inside each cell. The cells use DMG to help transport oxygen to fuel the Kreb's cycle. Dietary supplementation makes additional DMG available to cells throughout the body. 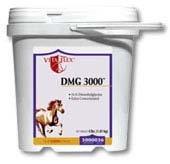 DMG is a water soluble nutrient and is readily absorbed. Available Size: 4 lb (128 maintenance servings) There are 750 mg of DMG in each 1/4 ounce serving.